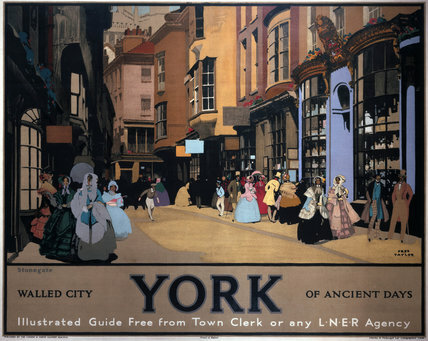 'York - Walled City of Ancient Days', LNER poster, 1930. Poster produced for the London & North Eastern Railway (LNER) to promote rail travel to York, Yorkshire. The poster promotes the historic aspect of the city by showing Victorian shoppers on the ancient street known as 'Stonegate', one of the main roads originally established in York by the Romans. Artwork by Fred Taylor, who was commisioned in 1930 to design four ceiling paintings for the Underwriting Room at Lloyd's and murals for Reed's Lacquer Room. He exhibited at the Royal Academy and other London galleries and worked for the Empire Marketing Board, LNER, London Transport and several shipping companies. 'York Minster', LNER poster, 1923-1947. 'Dresden via Harwich', LNER poster, 1923-1947. 'King's Lynn', BR poster, 1948-63. 'King's Lynn', BR poster, 1948-1965.